The Masters Tournament (also referred to as, “The US Masters”) is one of professional golf’s four major championships. Taking place in the first week of April, it is the year’s first major and is the only one of the four majors whose location never varies. That location is the Augusta National Golf Club, a privately owned course in the US state of Georgia. The Masters was launched by amateur champion Bobby Jones with the help of investment banker Clifford Roberts. After his 1930 grand slam, Jones decided to create his own golf course. He, therefore, bought a former indigo plantation and co-designed the project in conjunction with Alister MacKenzie, the course architect. Work began in 1931, with the course formally opening in 1933. However, MacKenzie didn’t live to see the first Masters Tournament played in 1934. First opened in 1933, the course has been modified repeatedly. Greens have been reshaped and, sometimes, entirely re-designed. Bunkers have been added and water hazards extended. Several hundred trees have also been added, as have new tee boxes. Several mounds have been installed. 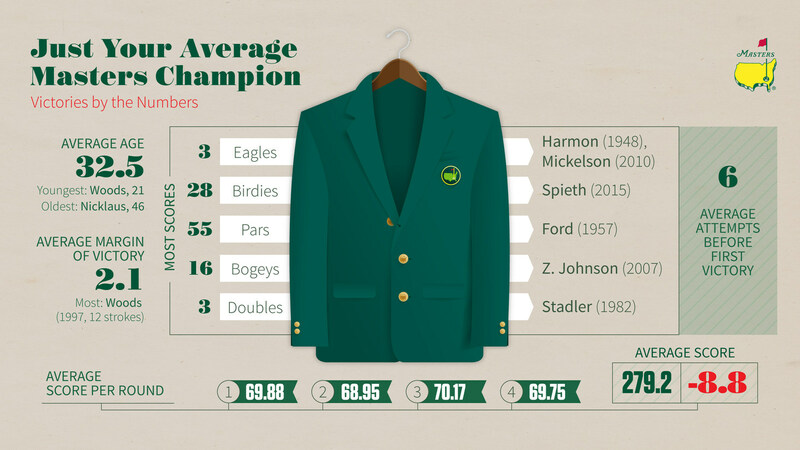 Since 1949, the winner has been awarded a green jacket but, the year after his victory, he must hand it over to the clubhouse, so it can be stored with those of previous champions, in a specially assigned cloakroom. Despite that, it is still regarded as belonging to him. Provided there is no compelling reason for him to be fitted with a new one, a competitor who wins the event more than once continues to use the green jacket that was awarded him upon his initial win. Inaugurated by Ben Hogan in 1952, the Champions Dinner takes place the Tuesday prior to the tournament, being open only to past winners and invited board members of the golf club. Since 1963, play has been commenced by an outstanding golfer, usually a former champion, hitting a ceremonial tee shot before the start of the first round. The first ever Masters champion was Horton Smith who collected $1,500 for his victory. Jack Nicklaus has won the most Masters titles, with six, between 1963 and 1986. He was 46 years and 82 days old when he won in 1986, making him the tournament’s oldest ever winner. Conversely, the youngest winner is Tiger Woods who achieved his 1997 victory at the age of just 21 years and 104 days. The course record of 63 is jointly held by Nick Price (1986) and Greg Norman (1996). The record winning score of 289 (+1) is shared by Sam Snead (1954), Jack Burke Junior (1956) and Zach Johnson (2007). Golf betting online at 10Bet also with live betting Golf odds! Join Now to get the 50% match deposit Welcome Bonus up to £100! Get up to €200 as an SBOBET Welcome Bonus! See the best odds in Golf betting and enjoy bigger wins with SBOBET Asian Handicap, 1X2 and Over Under betting.